KidsEBookBestsellers.com: REASON TO BREATHE: Two Weeks in the Kindle Top Ten for Teens! REASON TO BREATHE: Two Weeks in the Kindle Top Ten for Teens! Reason to Breathe by Rebecca Donovan hit the #10 spot in the Teen & YA section of the Amazon Kindle store on June 21st. The following week, on June 27th, it rose a few more spots to #6. It's the first book of three in the The Breathing Series. Rebecca is a USA Today and Wall Street Journal Bestselling Author, and she joins us today to share about her e-publishing success. Rebecca, first tell us what your book is about. 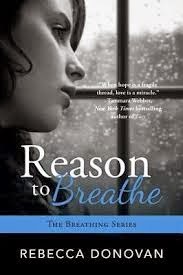 Reason to Breathe is the story of Emma Thomas, who is hiding a terrible secret, and she will do anything to protect it. But Evan Mathews changes everything. Suddenly Emma has more to lose than she’s ever had before. Is keeping her secret worth losing a chance at true love? When I was finishing Reason to Breathe three years ago, I tried to get published traditionally. But after reading several articles about rising eBook sales, I decided to self-publish. The success was amazing over the first year, but I continued to work full-time within the event industry while writing the sequel. When I published the next installment, Barely Breathing, the series felt like it exploded. I was contacted by my agent, and within a few weeks we were contacted by publishers. And my next two books, Out of Breath and the upcoming What If have gone the traditional route from start to finish. It’s so surreal and exciting how much has happened in just three years! The Breathing Series is a story that, above all, makes the readers feel. That was my goal, to truly touch people and make them examine their own lives, their own choices. And it happened! People connect with Emma, Evan and Sara. For some their eyes are opened to the world of an abuse victim. They’ve never really thought about life from the victim’s point of view. For others Emma’s story is one they can relate to because they too are survivors. Regardless of life experience the books seem to affect people on a personal level, and I’m so, so honored by that. My initial success can be attributed to my readers. Their recommendations to friends. Their reviews online. I didn’t really think about marketing until after I published Reason to Breathe. Then I created a Facebook page, a website, eventually a Twitter account. I didn't even create my own Goodreads page for the book, readers did. I fumbled through the social media outlets and soon discovered that readers wanted a way to reach me, and I loved interacting with them. Now everything is so different. I still LOVE interacting with fans on social media, but now I also meet them in person at author signings, hold contests, have book-themed merchandise, and right now we are starting up some exciting promotions for What If! It is crazy how much work still needs to be done after a book is written. Right now What If is written, and it has been edited—multiple times. And still there is work to be done. The cover is in production, the marketing is being hashed out, copyedits will be arriving soon, and so on. Still so, so much to be decided and finalized. But What If will be available in e-book format September 16th! The paperback won’t be available on January 20th, so I guess that is one major benefit of e-book publishing the production time is very much reduced, and the stories can get to the fans much faster! I am also excited to start working on The Burning Series—a spinoff of The Breathing Series centered around one of its most complex and controversial characters, Jonathan Reese! More news from Rebecca: Reason to Breath has been optioned for film! Read all the details at her blog. Keep up with the rest of her news by using the links above to follow her on Facebook and Twitter.